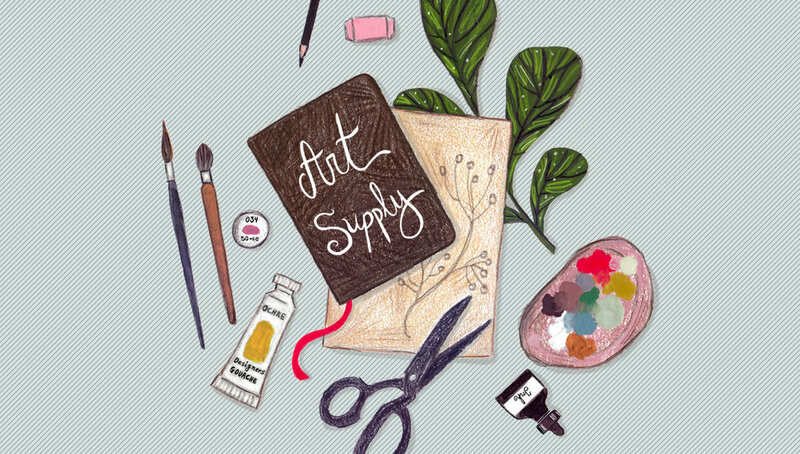 What are my essential art supplies? I often get asked about the art supplies I use to create my illustrations. Reason enough to make a video about the subject — you'll find that below. The past few years I've experimented with loads of different materials. I highly recommend it to anyone who likes to draw, a good way to find out what works best for you. After all, there are so many options when it comes to paints, pencils, inks, markers, and all other wonderful mediums! And there's a lot to try out in the paper and brush department as well. Meanwhile, I've found my essential go-to's I use to create nearly every artwork. For instance, watercolor and gouache paints are indispensable on my desk. And touching on paper, I love it heavy and structured, preferably A4 or A3 size. From my collection of twenty brushes, I tend to only grab the same four every time, kind of similar to my bra-picking process in the morning. Anyone else? In the video, I don't mention every product name. You can make fabulous art using materials from any brand or in any price range. However, if you'd like to know, I've added a list in the description of my video on Youtube. Illustrations I make for print or online, need to be scanned and edited digitally afterward. Maybe I'll write something about that in a separate article. If you'd be interested in that, please do let me know through Instagram. Are your illustrations good enough to get paid work?